Over the last couple of years, and especially when I was out of work, I started taking after my dad and stocking up on certain items when they’re on sale. This easily explains why I have about a million bars of soap as well as a lifetime supply of Glad Press N Seal (best stuff ever!). Anyway, sometime at the beginning of summer, I noticed graham crackers and marshmallow creme on sale. Not a big fan of the creme, I bought and figured I’d use it to make fudge or something. Well, that something turned into these bars. The original recipe calls for these to be made in an 8×8″ pan and cut into 16 bars. We have way more than 16 people at my office, so I knew this was one recipe that needed to be doubled. (You’re welcome Evan!) The bars were easy to pull together and taste incredible. I was on the fence about them the night I baked them, but the following day they won my heart. 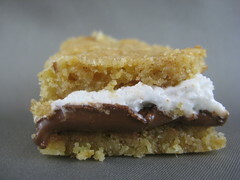 A soft, chewy cookie, a layer of chocolate, a layer of marshmallow, and topped with another cookie. Heat oven to 350°F. Grease 8-inch square baking pan. Beat butter and sugar in large bowl until light and fluffy. Add egg and vanilla; beat well. Stir together flour, graham cracker crumbs, baking powder and salt; add to butter mixture, beating until blended. Press half of dough into prepared pan. Arrange chocolate bars over dough, breaking as needed to fit. Spread with marshmallow creme. Patch together pieces of remaining dough over marshmallow; carefully press to form a layer. Bake 30 to 35 minutes or until lightly browned. Cool completely in pan on wire rack. Cut into bars. Whoa, that looks good. Whoa. Gah, I just made S’mores cookies! These would have been equally perfect (and look a lot easier). I made these just last weekend for a party – I think the adults enjoyed them more than the kids! Haha. And today is National S’mores Day! Happy day to you! Those look delicious! I made these yesterday, they were delicious! The marshmallow spread is so sticky and yucky to work with, do you have any tips…? Thanks again, major YUM. i’ve made these many times in the past and i love them!! looks like we’ve made some of the same recipes! (including the previous post..) great site!